Broth is a keystone of traditional food — and especially the gut-healing GAPS Diet. We should have some every day! Yet… sometimes we just don't want to drink it straight all the time. My friend and fellow blogger, Mindy from Too Many Jars In My Kitchen!, helped me compile a list of creative ideas for getting broth into your daily routine. Learn how to make your own broth here. And remember, if you're on GAPS, sometimes a 12- to 24-hour simmered stock (aka broth) is too strong for the sensitive digestive system. In this case, simmer for fewer hours rather than more. Even if you're not on the GAPS Diet, broth is nourishing for everyone. Try some of these ideas to get that broth in without drinking it straight and just see if your digestion and satiation doesn't improve! And, for even more inspiration, check out 5 Ways To Make Your Bone Broth More Exciting. After soaking in water (see how to soak beans here), cook your lentils or white (navy) beans in stock for extra flavor and nutrition! Mindy recommends the Basic Lentil recipe from Nourishing Traditions. Cook your roast beef and veggies in 1 to 2 cups of beef stock. Then strain out the stock and boil to make a reduction sauce. Spoon over the meat and veggies as a gravy when ready to serve! Make GAPS sausage or meatballs with extra fat to prevent them from drying out. Then after frying, simmer in a bit of stock and serve! Add 1 or 2 cups of chicken stock to your roasting pan when roasting a chicken. A little extra yumminess never goes amiss! Be sure to check out How To Cook Pastured Chicken and — on a related note — Perfectly Moist Turkey Every Time. This is especially important if you're on the GAPS Intro diet (learn more about that here). You can also reheat your meats in broth. After stir-frying your veggies, add a cup or so of broth and let simmer for a few minutes before serving. Again, this is super important on the GAPS Intro Diet! You can even save the stock to use again for other veggies, if desired. Blended soups are delicious with stock as the base! Check out our round-up of blended soups here. Instead of adding water when pressure cooking veggies or meats, add stock! Our Mediterranean Instant Pot Lamb Roast demonstrates this to perfection. Just skip the potatoes if you're on the GAPS Diet. How Much Stock Should You Drink? While it adds variety to use stock in other ways besides soup or just drinking a cup of it, it is an important part of GAPS to have at least one cup of soup or stock each day. During my year on GAPS, I’ve come to really enjoy having soup or stock at most meals. It provides gelatin for healing the gut, is an extremely nourishing food, and makes you feel very satisfied! I love to add ghee or butter (those further along with dairy could do sour cream, too) and an egg yolk or two. It also makes a wonderful snack between meals. How much broth do you drink every day? Do you have any more ideas to share? Thanks so much for posting this today. I am in the preparation phase and was wondering this same thing. So very thankful for people like you who take the time to share and post :). I make reduction sauces all the time- so lovely! Especially when serving roasted chicken, I’ll boil some chicken stock and let it reduce (with herbs sprinkled in) and then swirl in a pat of grassfed butter at the end. Perfection!! Amy, I love your description of your chicken stock reduction. I don’t think to do that as much as I do beef stock reduction. That is going into my rotation, for sure! Such great ideas! I’ve only used stock in soups or for cooking rice. I like to “drop” eggs into simmering broth to which I’ve added sea salt (trying not to break the yolks), give them a gentle stir to separate the eggs from each other (they like to hug when dropped into broth 😉 ), cook to desired doneness (put a lid on to cook them on both sides at once), then serve them as an egg drop soup with a liberal addition of butter on top. I often add herbs and granulated garlic, and I think some sauteed green onions would be good, too. Or make a mock French onion soup with/without the eggs, and top with almost any GAPS legal grated cheese, or a big dollop of Kefir cheese. Personally, I don’t miss the croutons. I like to have my egg drop soup/poached eggs for/with any meal that doesn’t contain meat. Brenda, I love your idea of dropping eggs into your broth. That sounds delicious! After soaking and sometimes slightly sprouting buckwheat we cook it in stock. Yummy with eggs . Christina, I love the idea of your GAPS gravy! I’ve seen people doing that around various blogs, but I still have yet to try it. I’m going to have do to that soon! I am looking forward to your post next week on keeping stock on hand!!! This is something new I really want to get down for my family. We have soup daily for lunch and I just don’t get tired of it…as long as I switch up the broth and ingredients. Even in our HOT Texas summer, we don’t mind it. We just don’t heat it too much. I can’t get over how wonderful soups taste with homemade broths. Chilled stock is refreshing on a hot summer day. Stir in a little water if too gelled. A squirt of fresh lemon perks it up. I drank chilled stock on the liquid diet “prep” day for my colonoscopy (it was a really hot day!) and felt great throughout. I never would have thought about drinking chilled stock. Do you typically take the fat off the top first, then? I’ll have to think about giving that a try. Yes, I do skim off the fat first. I’ve heard cold broth is good in tomato juice, but I’ve not tried that. Ohhhh, thanks for the link to my sausage recipe. I love your suggestions for using broth. Although my son loves broth and soup and readily drinks broth by the cup, I have recently snuck it into a smoothie. It’s best to use broth that you’ve made without onions or garlic as that can put the flavor off (tried that – wasn’t too thrilled but my son loved it). Also as one commenter mentioned they make a gravy using broth and onions and vegetables, I do the same and cauliflower is a wonderful thickener for gravy. I use the darker mushrooms (baby bellas) to create a dark gravy. Great post, thanks for the great tips. I need to try using cauliflower. Sounds great! I never thought of trying that. Thanks for the great suggestion! I always cook my rice in stock. We eat a lot of rice and everyone notices the difference when I use stock! I always loved doing that before I started GAPS. It makes it so delicious! I use broth to cook greens in, along with a dollop of fat (whatever is on hand: bacon fat, coconut oil, olive oil, etc…). The greens and their broth are excellent served over rice or on their own, but the rice absorbs the broth nicely for those reluctant broth eaters. I like to reduce a lot of my bone broths down to a thick gel that I refrigerate and then cut into squares and freeze. I toss the squares into a freezer bag so I have it to add to any dish I happen to be cooking. Stir it into taco meat, stir fries or just make gravy. Most everyone loves gravy! There is a Hawai’ian plate lunch called loco moco that we love: hamburger patty topped with gravy and fried eggs, served over rice of course. Everything is served over rice in Hawai’i! I made it for dinner this week but instead of patties I just made hamburger gravy with onions and served fried eggs on top. Lots of broth in there! These are wonderful ideas. 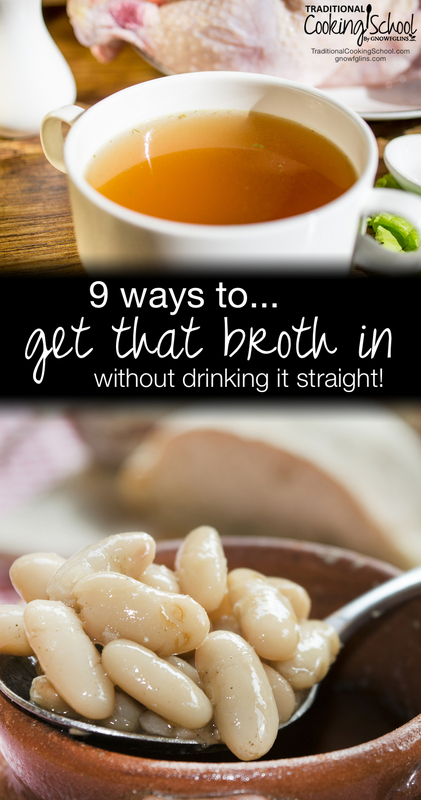 None of my family members will drink broth, so I REALLY appreciate these ideas. I just realized I have an idea of my own, which I have already been doing for a couple of years–instead of using milk and butter in mashed potatoes, I use chicken broth and olive oil (along with garlic, salt, and pepper). My whole family loves it and I guess I’m helping them get their broth! That’s a great idea to get broth into your family! How do you know if your homade chicken broth is S or E when doing THM meals, I do skim fat off the top of mine the next day. I use the whole leftover carcass w/ leftover skin, bones, bits meat, & neck, So what’s that make it? S or E and if I just wanted to drink 1cup would it be F. P. ? Letting the broth sit in the fridge for at least a day then skimming off the fat should make it a FP, though possibly not completely fat free like store bought. What you use to make the broth with doesn’t really matter since the fat rises and solidifies and you remove it. It shouldn’t be a problem we don’t think! That’s what Dawn, one of our writers, does with hers. Do have a nice hot cup of S broth sometimes, gloriously delicious!